JINMO's 106th album has released. Our biggest hit, the famous "Jubilus" series which seemed to had been completed, the fourth "Jubilus Ultra" which is more beautiful and more addictive digital drug symphony has just been released with big surprise! JINMO's 106th solo album, the title is "Jubilus Ultra". The biggest hit from Avant-attaque Download, the server crashed digital drug symphony "Jubilus Meditator", "Jubilus Activator" and "Jubilus Pulsar". Red, Green and Blue.. for its cover design, some says this trilogy as"RGB, the trilogy of light". We received reports about "Jubilus" experience from some listeners who got copies of Jubilus trilogy. They have repeated deep listening to Jubilus series like monitoring themselves, and they recognized the altered state of consciousness under the influences of "Jubilus". JINMOmanias and us, everyone thought that the series had been completed with the third album "Jubilus Pulsar". However, JINMO's desire to make the best and the definitive album of the series had increased inside of him. After an interval of about a year, it led us to this "Jubilus Ultra". The effect on the brainwaves depends on the difference in frequencies of each tone, for example, if 500 Hz was played in one ear and 510Hz in the other, then the Binaural beat would have a frequency of 10 cycles per second at 505Hz. This effect was discovered in 1839 by Heinrich Wilhelm Dove, and earned greater public awareness in the 1970s based on claims that binaural beats could help induce brainwave synchronizations. The research about them continued and it have been claimed to induce to the altered state of consciousness such as out-of-body experiences. "Jubilus" series are composed of ultra dense harmonic binaural beat orchestration. And the rhythm of difference tones are made of particle drones that I used first time in the album "Sirius". "Jubilus" means "Hallelujah of Joy" in Latin. 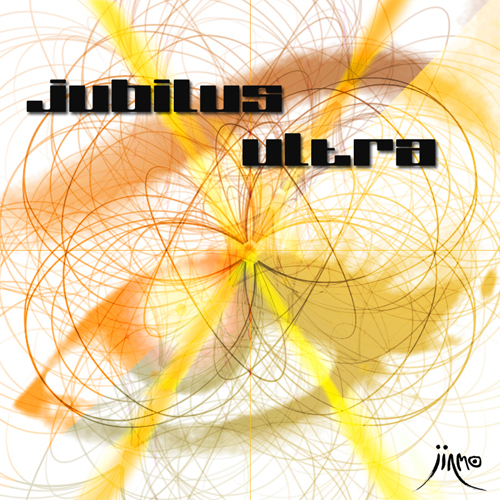 "Jubilus Ultra", it is chaos of binaural beats generated by swirling dense combination tone phenomenon. The sound is so complicate to recognize enough with all bandwidth including ultrasound bandwidth beyond all audible bandwidth. The experience listening "Jubilus Ultra" with headphones, it is "Jubilus" and so beautiful. Since I had released "Jubilus Pulsar" about a year ago, I had desired "plus ultra" (further beyond). Then I got "ne plus ultra" (no more beyond). Don't listen, just feel this 750 seconds. May the "Jubilus" be with you." Red "Jubilus Activator", Green "Jubilus Meditator", Blue "Jubilus Pulsar", then Yellow "Jubilus Ultra". As JINMO says, and as its title suggests, it is the "Plus Ultra". Enjoy "Jubilus" plus ultra with your ears and play your brain symphony.